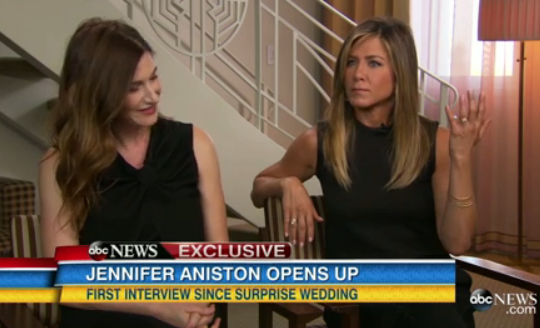 -I can’t believe I’m saying this, but I actually love Jennifer Anistion’s wedding ring. Never would have pegged her to pick a channel setting over a solitaire, but it’s lovely. -She also discussed keeping the wedding a secret on today’s Good Morning America. –Kelly Clarkson surprised herself by announcing her second pregnancy during a concert last night after she got really emotional. Mazel! -Not only did Beyonce land the all-important September cover of Vogue, she did it without having to do an accompanying interview. She stopped doing face-to-face sit-downs sometime before the elevator incident, and it hasn’t affected her popularity at all. As the NYT notes, “She’s been able to reach this level of stardom in which she’s managed — in a way that I really think is unique even among other black women entertainers — hyper-visibility and inaccessibility simultaneously.” Bow down to her. –Ben Affleck’s nanny is keeping the paps interested by giving them gifts. Bow down to her, too. –Josh Duggar has a paid Ashley Madison account because OF COURSE HE DOES. He’s already apologized or whatever. -It’s no surprise that Jennifer Lawrence is the highest paid actress in the world, but good on Chinese actress Bingbing Fan for landing at #4. -New albums from Beach House, Destroyer, and Yo La Tengo now streaming online, and there’s also a new Metric track. It’s like Christmas morning! -Did Michael Shannon‘s hilarious port-a-potty story reveal a big Batman vs. Superman spoiler? –Amy Poehler’s stand-in on Parks and Rec might have had the best job on the set. -The best part of Buzzfeed’s “How well do you remember The WB?” quiz is the old school promo they embed at the beginning, which features EVERY network star “partying” together in a club. I remember the part where David Boreanaz flirts with Shannen Doherty giving me so many squees back in the day. God, if the CW did this today I might pass out. -I adore the dress that Emma Stone is wearing in her new movie. She’s my pale girl inspiration. -I couldn’t get through the first Fifty Shades of Grey movie and sure the hell won’t be seeing the sequel, but how in the world is the frontrunner director not a woman?! Jesus, Hollywood. -Here’s the trailer for That Dog, a short starring Michael Cera, Tim Heidecker, and Natasha Leggero.